History: Torin Mac Quillon was a Celtic warrior around the era of the Roman invasion of Britain. The "Druid necromancer" Ambrosius prophesied that though the Romans might conquer Britain, "the dragon shall rise again." Later, during a battle, Torin was snatched from his own time into the far future to battle the tyrants who now controlled the Earth. He travelled the universe on the spaceship "The Jolly Roger", going to such unusual places as Cynosure. Comments: Starslayer was created, and drawn by Mike Grell for Pacific Comics (issues #1-6) before it moved to First Comics (#7-34). The original production run was for issues 1-6 then, 7-25 (?) was published by First. The later issues were written by John Ostrander who also wrote Grimjack. Jonathon Riddle notes "when the title jumped from Pacific to First comics, Grell stayed on board to write and draw issues #7 and 8. John Ostrander, whose only previous writing experience was for the stage, took over the writing chores with issue #9 and introduced his first comic book character creation, Grimjack, as a back-up feature in Starslayer issue #10. 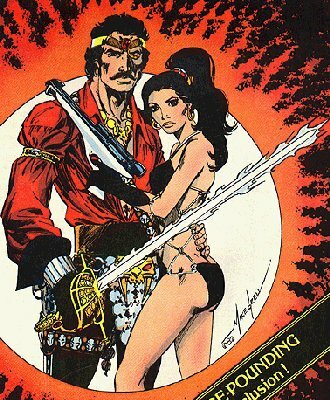 The Grimjack story lasted through to Starslayer #18, which was a cross-over story where Torrin MacQuillan got to meet John Gaunt, at which point Grimjack became its own series also published by First comics. The Black Flame became the new Starslayer back-up feature with issue number 20. This arrangement continued until Starslayer was cancelled at issue #34. Recently, Grell has released an expanded version of his original six issue Starslayer story through Acclaim comics titled: "Starslayer: Director's Cut" which ran for eight issues. On an interesting side note, when Jim Starlin was preparing to introduce Dreadstar, his original title for the series (and its main character) was originally meant to be "The Starslayer". Grell had to inform Starlin that the name was already taken and thus Jim came up with the name "Dreadstar" as a substitute." Thanks to B. Downing for correcting me about who created this character.